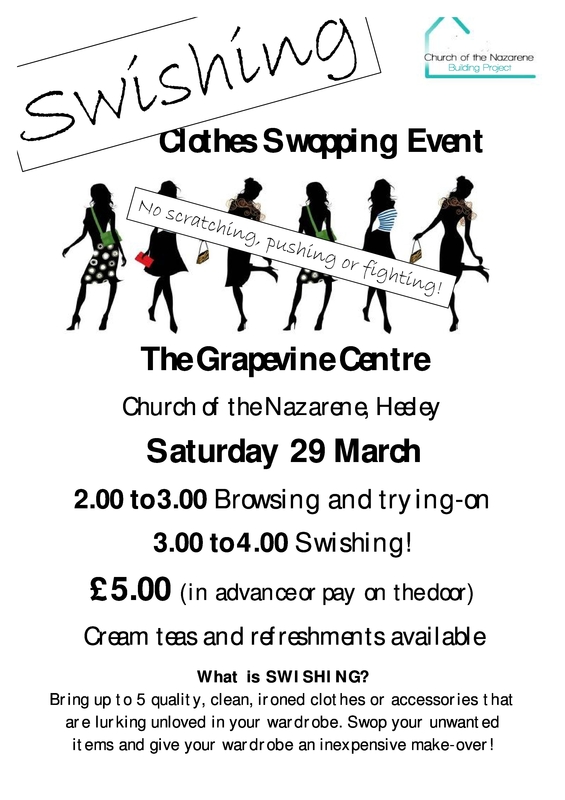 Swishing event @ Church of the Nazerene – Sat 29th March – 2pm onwards | IT'S HAPPENING IN HEELEY! Please support the Church of the Nazarene Building Project by coming along to this fun Swishing event. Bring up to 5 quality, clean, ironed clothes or accessories that are lurking unloved in your wardrobe. Swop your unwanted items and give your wardrobe an inexpensive make-over! Saturday 29 March 2pm to 4pm, £5 on the door. The Church needs to raise a total of £100,000.00 towards the building project: thanks to ongoing support we have already raised a whopping £66,000.00! We will also be applying to Viridor, Veolia and other funders for grants totalling £180,000.00.